Two tier cycle parking has been one of the fastest growing areas within the cycle storage sector. 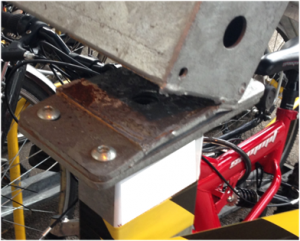 We have certainly seen a massive upsurge in popularity of this space-saving solutions, especially at places such as rail stations where space is at a premium and the demand for secure cycle parking is on the increase. Recently we became aware of a problem with some two tier cycle parking racks in the market (not those produced by Lockit-safe) and it got us to thinking that those who are specifying and purchasing two tier cycle parking need to be made aware of how to avoid potential problems. One of the main problem areas is the top tier and how it is welded to the bottom tier. It is a potential weak spot as the pictures demonstrate. The broken weld on this installation resulted in the plate buckling and the top tier collapsing at one end. Fortunately in this instance no one was hurt but several bikes were damaged. Problems such as these are caused simply because the correct strength of weld and steel has not been used. Whether this is due to cost cutting or to try and make the rack as light as possible, the end result is a product that cannot cope with the weight of the cycles and the regular movement of these cycles as they are loaded and unloaded. Are we finally starting to reach the sustainable travel levels of our continental cousins?